As of 5:10 last evening I have been a mom for 7 years. Where in the heck has the time gone? Seriously...Dane has grown so fast. Everyone tells us that kids do this, but until a parent has experienced this phenomenon firsthand I think it doesn't really sink in. This whole parenting thing is totally surreal. Dane had a 2 hour delay for his birthday, then last night we took him to our favorite little chinese restaurant in town for a buffet supper. After eating we came home and he opened his cards and finally got the slot car track that was *supposed* to be from Santa (but Dane found in my closet, so we put aside). On Sunday we will be doing a bowling party down in Grand Haven (near his school and most of his closest friends). Pizza, bowling, cupcakes. He's really excited and this will be his first REAL party. So far it appears it will be about 10 kids, which is a great, manageable crowd. Yesterday I ran just shy of 10 miles. My respiratory gunk continues to hang on and the roads were pretty trashed from the blizzard the previous day, so I didn't push it. Today I hope to do 3-4 miles, since my wear test on the flashy NB shoes is coming to a close and I haven't done any miles in them since Monday. awwww! 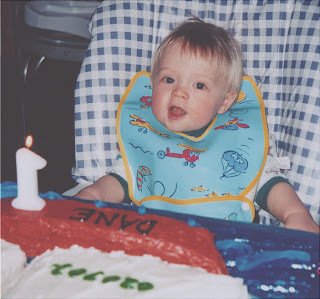 baby dane...::heart:: I hope the big guy had a great day! :) It is definitely cuh-razy how fast time goes, and how quickly they go from babies to full fledged little people. It's like life goes on "fast forward" mode once children are in the picture. You ain't a kidding the time flies! I have two teens! EEEEK! Have a GREAT time at the party! Have a great birthday party Dane! Happy birthday! Glad you got in some miles, k. Near 10, that's awesome, especially considering the crap you have to run in and with. Hope you're feeling better.